Provenance: The collection of Alain Renard, Paris, 1983. The automaton in this lot is illustrated in the Japanese reference book by Goto Keiichiro, (1982), Les Poupees de Paris, p. 179. Note: A similar automaton was offered in the 1884 catalogue of the Parisian department store Au Louvre. 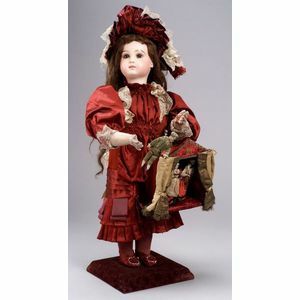 With the addition of a Bebe Triste head, an acrobat (instead of marionettes) and an animated dog in her basket, the figure cost 290 francs and was clearly a deluxe model. Only three examples of this other piece are known (two in museums, one in a private collection), while the lot offered here is believed to be the only example to include puppets. 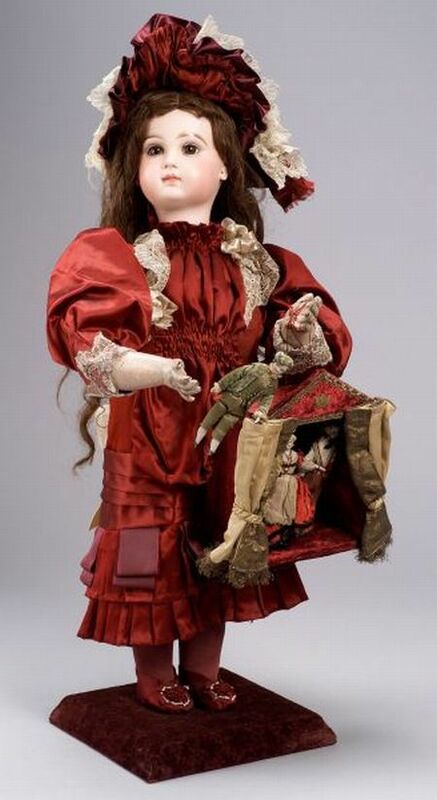 The figure turns and nods her head, raises her right hand, throws four kisses, and twists the strings in her left hand to make the puppets dance.